Chippendale’s latest small bar, the brainchild of a famed mixologist, offers dizzying creativity and lashings of gin. In his 1751 painting Gin Lane, William Hogarth captured a particularly febrile moment in English history, when London was in the grip of a ‘gin craze’. As consumption of the spirit reached dangerous levels, the painting depicts a scene of drunkenness and debauchery, including a baby slipping out of an inebriated mother’s arms. The scene at Chippendale’s recently opened Gin Lane is far more genteel than this long-forgotten madness, though it retains some of that zeal for the juniper-based spirit. Located in a smartly renovated Eighteenth century terrace house, the bar is warmly lit with neat design touches across like hanging floral lights over a well-stocked bar. With capacity for just 45 gin hounds, it’s small but stylish and the front porch is an ideal place to sit and watch the foot traffic through one of Sydney’s youngest but most consistently interesting food precincts. The cocktail menu, designed by pioneering mixologist Grant Collins and overseen by knowledgeable yet laidback bar staff, showcases every imaginable variation of gin. It also showcases no less than 75 different gins, from big name distilleries to fledgling boutiques from around the globe. One of the gin and tonics on offer shares a name with the bar and the Hogarth painting and combines a base of London Dry Gin (on tap) with lavender and grapefruit bitters and Fever-Tree tonic, bringing light, floral aromatics to the standard G&T. 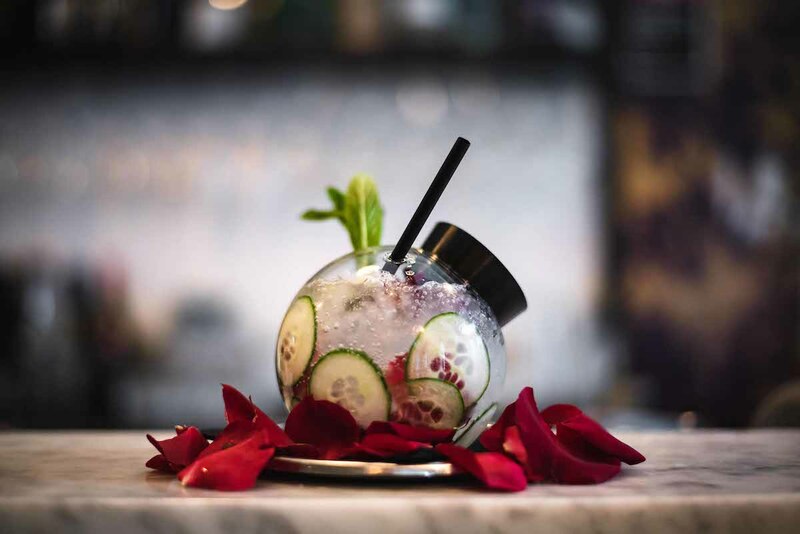 Another twist on the old favourite is the Cucumber & Rose: it’s a summery drink fit for an English garden party, with vividly coloured petals swirling like tropical fish in a dome-shaped glass. Cucumber & Rose: Organic Rose & Cucumber Gin, Elderflower, Fever-Tree Tonic, & Tonic. Over a globe-trotting career, Grant Collins has become known for his wildly inventive approach to cocktails and fondness for deconstruction and molecular mixology. 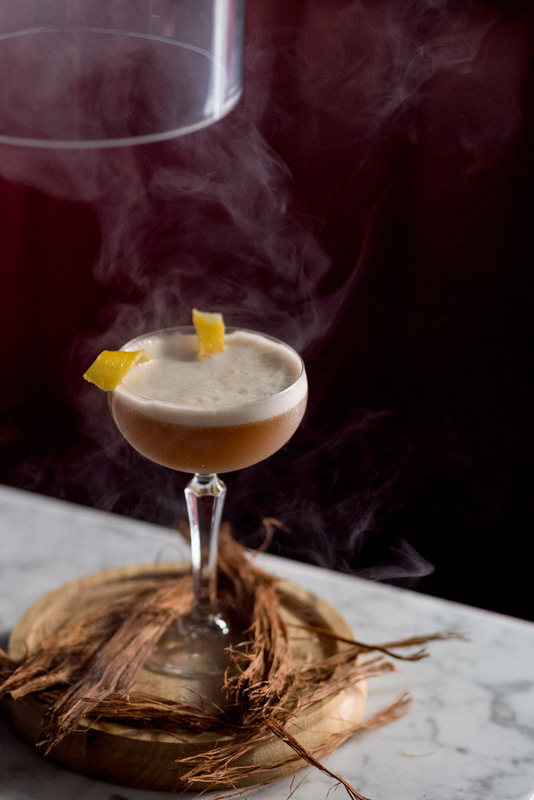 His avant-garde style is all over Gunpowder Plot, maybe Gin Lane’s most memorable concoction, which takes cocktail craft in a theatrical direction, arriving in a smoke-filled bell jar. The idea is to inhale the billowing aromatic smoke as it is unveiled and take a sip straight away. The drink itself lives up to the elaborate presentation, the smokiness pairing ideally with the almost honey-like sweetness of dandelion bitters, the spice-laden Italian liqueur Fernet-Branca and thick house-made five-spice syrup. Designed as a tip of the hat to the English celebration of Guy Fawkes Night, it’s one of many menu items that hint to the role gin has played in many of the major movements in England’s history. Gunpowder Plot: Gunpowder Tea Spiked Gin, Fernet Branca, Gunpowder Syrup, Dandelion & Burdoch Bitters, & Fresh Citrus. Served In A Smoking Cloche W. Gunpowder Twigs. Another historically themed tipple is the Gin Riot, named after a series of events that saw people take to the streets in protest after the government legislated to raise gin prices. The cocktail gestures towards some of that cacophony, being one of the more experimental menu items with chunks of candied banana and crystallised ginger perched on a stick across the top of a long glass. The suggestion is to take a taste of the banana and ginger and then sip from the drink, hopefully achieving a marriage of the sweet and slightly sour flavours, which include wheat beer and a hint of clove vinegar. A more classic option is a Lemon Aspen Gimlet, complete with locally foraged lemon aspen, a native plant with tiny, highly tart citric fruit. A Blood Orange Negroni is similar in providing a new twist on a classic and comes across like an upmarket alcoholic slushee. Arriving in a brass tankard, it offers a sherbety, citric adaptation of what is perhaps the definitive gin cocktail. The menu spans gin cocktails served short and long, in tumblers, watering cans and fishbowls, straight or with olives and citrus. In the unlikely event you’re bored of all these variations, there is also a selection of whisky, tequila and a wine list spanning Australia and France. William Hogarth, who believed that beer was a far more civilised drink than gin, would likely cast an approving eye on the respectable list of craft beers. While the focus is firmly on the endlessly inventive drinks menu, there is also a handful of snack options, designed with drinks pairing in mind, including chicken wings with sticky tamarind sauce and a cheese plate generously piled with cheddar, brie and blue cheese. Fishbowl G&T: London Dry Gin, Lavender Bitters, Grapefruit Bitters, & Fever-Tree Tonic. Straight From The Tap, Served In A Fishbowl With Fresh Pink Grapefruit, Mint & Jelly Fish. 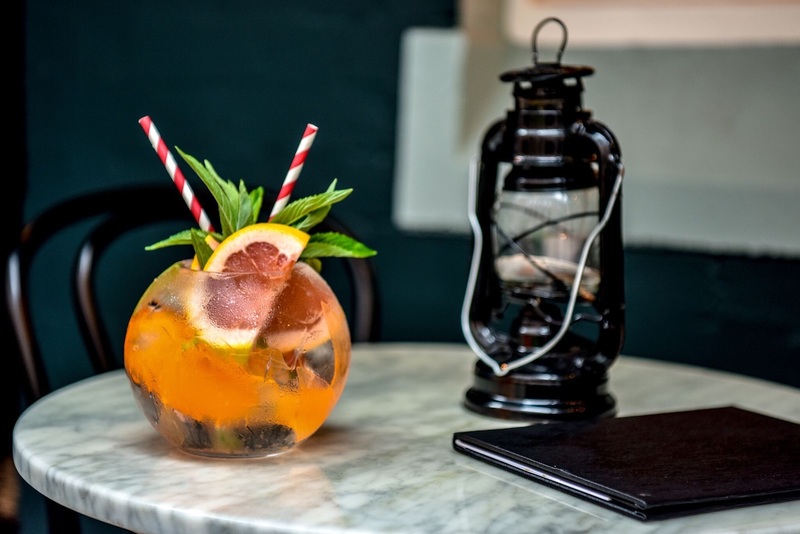 The venue also has plans for live music and art installations, but for now Gin Lane works as a clever and hugely creative homage to gin, the spirit that almost drove a city wild, in all its various iterations.